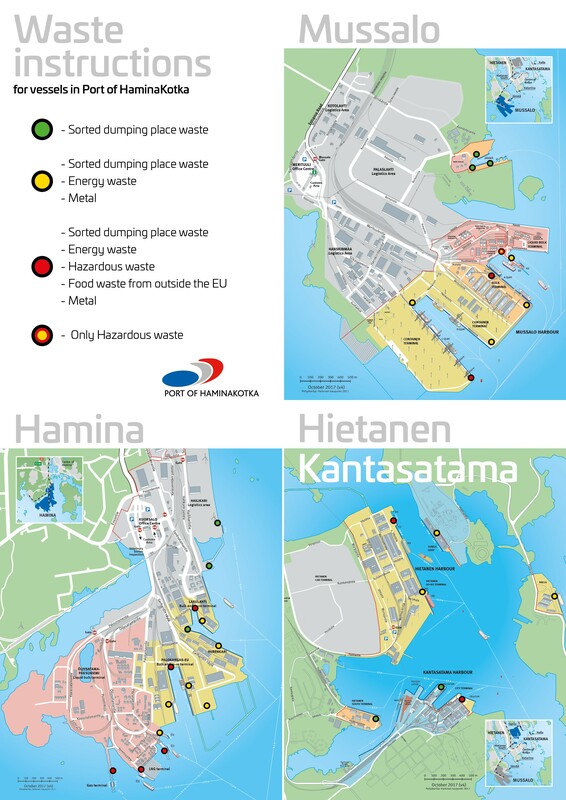 By virtue of the Finnish legislation concerning vessel waste management, vessels must leave all their waste generated at the vessel and cargo residues to port reception facilities (this concerns liquid oily waste, liquid and solid hazardous waste, lavatory water, and solid waste including cargo residues, category I catering waste, and waste for which the port does not have a specific collection system). Moreover, the vessel must provide the port of arrival with a notification concerning waste generated at the vessel and cargo residues in accordance with the form approved by the Finnish Transport Safety Agency (Trafi). As a rule, this notification must be made 24 hours before arrival at the port. Hazardous waste is only received by order. The order must be made 24 hours before the delivery of waste. The order must be made to the Duty Officer of Traffic Services, tel. +358 (0)20 790 8840 or by e-mail crane.vessel(at)haminakotka.fi. The charge for the service is in accordance with the price list of the Port of HaminaKotka.